There is a sense of continuity that comes with publishing a magazine every two months. 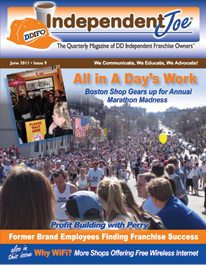 For DDIFO, this magazine has provided an opportunity to explore and explain in detail how the business of running a Dunkin’ Donuts restaurant is constantly changing. Our work requires that we are always looking ahead—to understand how the past can impact the future and to present information in a context that will be beneficial to our members. With this being our 50th issue, we wanted to take a moment to look back at some of the important and notable stories we’ve covered and remind you that Independent Joe was recognized with Folio Magazine’s national Eddie & Ozzie Award for cover design in 2014. One thing we noticed as we combed through piles of old magazines: Even as the look and feel of the magazine has changed over time, the content is consistently focused on the great work franchisees do every day to keep Dunkin’ Donuts the premiere coffee and snacks brand in America. There is a strong sense of loyalty among the ranks of franchisees, whether they be in Massachusetts, Missouri or Montana. There is also a sense among franchisees that the relationship they have with their brand can be altered by circumstances beyond their control. 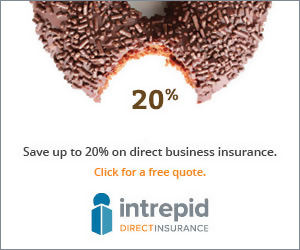 It is why DDIFO exists and is a model for other franchisee associations to follow. Even as we work towards publishing IJ No. 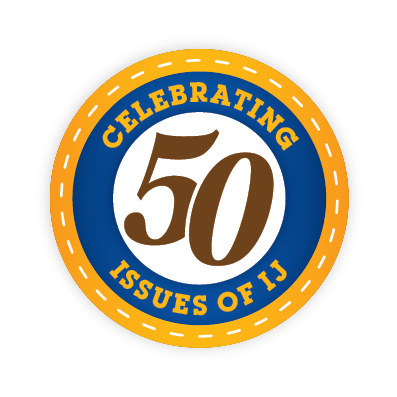 51, we don’t want to miss the chance to share with you some of the highlights of our first 50 issues. The following snapshot doesn’t come close to commemorating all the work our team has accomplished, but like IJ itself in 2009, it’s a start. 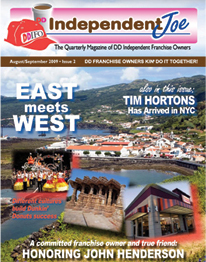 The second issue of Independent Joe devoted several pages to recalling the contributions franchisee John Henderson made to the Dunkin’ franchisee community. The issue came out just months after Henderson’s death shook the franchisee community. The article we published announced the establishment of a golf tournament in Henderson’s name. The first John Henderson Memorial Tournament was held in August, 2009. Like Indy Joe, the annual tournament is still going strong. Throughout his life, John Henderson devoted his time and effort to raising money for worthy causes, like the Special Olympics cancer research. When the disease took his life, the Dunkin franchisee community came together to ensure John Henderson would always be remembered for his good works – behind the counter and in the community. At the time, Chicago had not yet established central kitchens. Shah and his partners had the foresight to build a production facility capable of expanding as more Dunkin’ Donuts shops opened in Chicagoland. Today that first Chicago CML is the second largest in the DD footprint, eclipsed by an even more impressive operation near Chicago Midway airport. It is a model other operators have since followed and, it is still one fine example of how innovation among franchisees drives the success of Dunkin’ Brands. Discussions about how Dunkin’ Brands was allocating advertising funds generated by franchisee contributions were getting heated in 2009, right as Nigel Travis was getting established as the new CEO of the then privately held company. 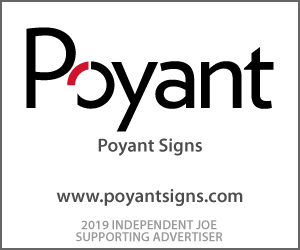 When Independent Joe looked into ad fund spending in Issue No. 4, what we mostly heard was that franchisees were optimistic there would be greater transparency in how ads were designed, produced and placed under the brand’s new leadership team. For decades, Dunkin’ franchisees had invested in newspaper coupons, radio ads and signs adorning the walls and fences of sports arenas. Franchise owners understood the value of smart ad spending through the pooling of funds. But over the years, many franchisees expressed concern that decisions about how that money was being spent were made without enough of their input. “Years ago, we saw ad sketches,” one franchisee who requested anonymity told Independent Joe in 2010. “More recently, we see them when they are on television. If we complain, we are told the focus groups like the ads,” he said then. Concerns in 2010 faded as Travis’s leadership team held true to their promise to make the process more transparent. Dunkin’ has maintained its lead as an advertiser in the QSR category, helping fuel excitement for new store openings in emerging and West Coast markets. “On a normal day, we serve around 1,100 customers, but on Marathon Day it’s over 1,500,” said Simopoulos. “We sell more of everything,” and thousands of people are lined up outside their location to get a view of the elite and not-so-elite runners completing the world’s oldest annual marathon. One lesson the team at 715 Boylston St. learned over the years is that ice can be the first thing to go. Alepedis, who has been a franchisee since the 1970s, says he never really grasped why people would want to drink cold coffee, yet iced brews are a top seller at his shops—especially when the third Monday in April is hot and humid. Alepedis used to have bags of ice delivered, until one year when they ran out, owing to the increased popularity of Dunkin’ iced coffee. That was when he installed three ice machines. On Marathon Monday one crew member is assigned to scoop ice and monitor the machines’ performance. In fact, the crew has hand signals they use to keep operations behind the busy counter running smoothly—like the distance runners passing by their shop and through the finish line. Two years after Indy Joe visited the Copley Square shop, terrorists detonated two homemade bombs just yards from Alepedis’s front door. Three bystanders were killed and 264 were injured, many severely. No one inside the Dunkin’ Donuts was harmed, but the blast left a lasting impression and has changed how everyone – the Dunkin’ team included – looks at Marathon Monday.